The cycling of iron throughout the oceans has been an area of intense research for the last two decades. Oceanographers have spent a lot of time studying what has been affectionately labeled the Geritol effect ever since discovering that the lack of iron is a reason why phytoplankton grow lackadaisically in some of the most nutrient-rich surface waters. Just like humans, sometimes the ocean needs a dose of iron to function more effectively. 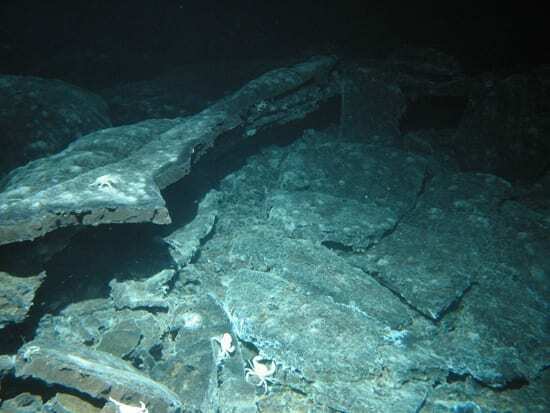 It is well known that the hydrothermal vents lining the mid-ocean ridges are a major source of iron to the ocean. Vent fluids contain about one million times more iron than regular ocean water. But the iron pumped out of hydrothermal vents has always been thought to immediately form mineralized particles when it mixes with seawater. This form of iron has as much value for the ocean as chewing a rusty nail would have for a patient with anemia. 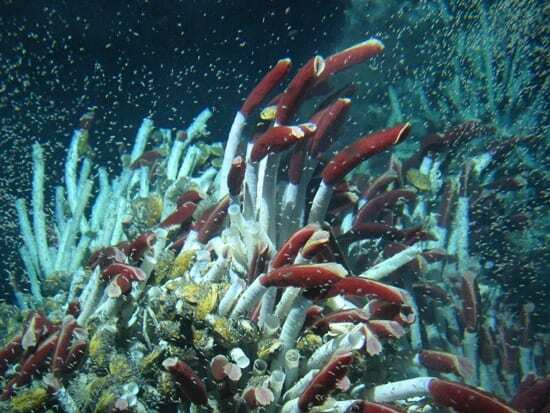 In a new paper published in Nature Geoscience, Brandy Toner and her colleagues report on the unexpected discovery that some of the iron spit out of hydrothermal vents remains in a form that organisms in the ocean crave. Toner was a NASA Post Doctoral Fellow at Woods Hole Oceanographic Institution when the work began but has since taken a position as Assistant Professor of Environmental Chemistry at the University of Minnesota. Toner says, “Iron doesn’t behave as we had expected in hydrothermal plumes. Part of the iron from the hydrothermal fluid sticks to particulate organic matter and seems to be protected from oxidation processes.” In other words, the interaction between iron and carbon in vent fluid acts like Rustoleum stopping corrosion. The fact that carbon is a key player in the process heightens the intrigue. Toner’s co-author Chris German, senior scientist in the Department of Geology and Geophysics at WHOI, explains, “So the question becomes, what are those organic compounds? Are they organic compounds like in oils and tars or is it actually the stuff of life? Brandy’s work doesn’t mean that these [carbon-iron] complexes are definitely alive. But, this is a possible smoking gun.” A smoking gun that might connect what has been traditionally viewed as a completely inorganic process, hydrothermal venting, with the global carbon cycle. Toner’s careful mapping revealed the detailed structure of vent sediments. She compares the form of the particles to gooey jello with bits of fruit embedded in it. Her analysis showed that the jello-like part is a complex matrix of carbon compounds. X-ray spectroscopy of the jello regions unexpectedly revealed that they are a form of iron called iron(II), a delectable treat for iron-starved organisms in the ocean. Exactly how the iron(II)-laden carbon particles might interact with the ocean food web is still to be determined. Coauthor Katrina Edwards, who was at WHOI when the work began but has since moved to the University of Southern California, is studying microbiological processes associated with the vent particles. German and the other coauthors at WHOI are working out details of the chemical cycling in the same plume materials. Toner is investigating both the global distribution and the magnitude of the phenomenon. One thing is certain: Toner’s work challenges current paradigms about both the iron and the carbon cycles in the ocean. German says, “This paper opens up a whole new line of research and asks a new set of questions that people didn’t know they should be worrying about until now. A bit of work on a tiny nanometer scale can force you to ask questions of global significance.” This kind of research is anything but rusty.